Recently promoted to Sheriff and transferred to the most dangerouswestern town in the middle of desert occupied by all type of evil,notorious, merciless outlaws running the town by themselves, withno law and order in the town and waiting for you to enter the townto kill you. Its time to show your shooting skills, sharpened senseand your target precision to those criminals running the town andtaken control of all the building of the town in Western CowboyBlood Shooter.Now is the time to eliminate all the outlaws of thetown in Western Cowboy Blood Shooter and save the innocents peopleof the town from the cruelty of those Gangsters and to take revengeof the people killed by those nasty Gangsters without any reason tocreate fear among the people and restore peace in the town.Nooption for surrender and to take prisoner for these evil criminalsin Western Cowboy Blood Shooter, shoot them before you get shot bythem. Keep your eyes on the windows and doors and finger on yourpistol trigger to shoot them on sight before got shot by them byjust taping on them. With three life chances how much criminalswill be taken care of by you?? 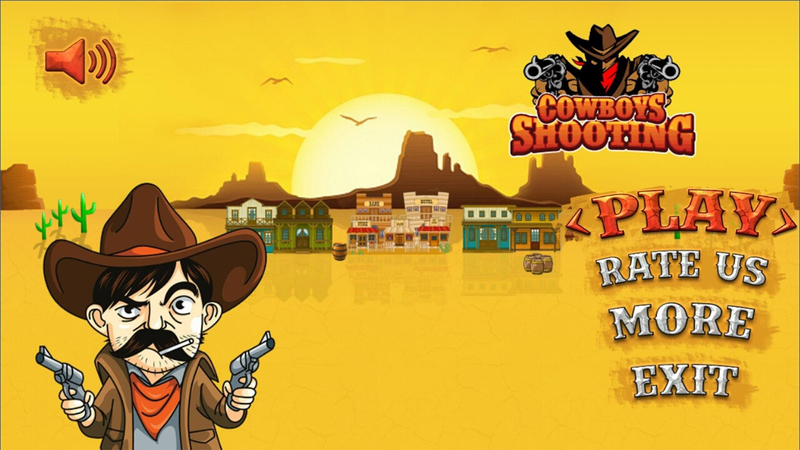 ?With the real western town graphicsand real cowboy’s characters, enjoy the 2D shooter game and makemaximum points in the game by playing for longer and break thescore records. Be a real shooter to eliminate all gangs.Sharpenyour skills by hitting the bottles in the bar, shoot as manybottles as you can in the limited time to become expert shooter inthe practice mode.Game Feature:- Beautiful and Eye Catching GameGraphics- Beautiful game Play Graphics & Environment- RealCowboys Characters- Multiple gameplay mode- Beautiful game sounds-Real 2D shooting experience- Simple and Easy game controlsStill notsatisfied and want the criminals to be erased completely from allthe western area then share the game with others to increase numberof shooters for quick clean-up operation. Help us improveGunfighter Cowboy Gangster by sharing your opinion. Call recording is becoming important and vital in modern era. Don’tyou find it interesting that all your service providers record yourcalls for future reference, how about record their calls as well soyou can use it in case of dispute resolutions ? Do you know thatthere are many companies out there to resolve your disputes withyour service providers like Ombudsman, CISAS etc. Automatic CallRecorder is specifically designed to help consumers to record theircalls with service providers so they can handle with nastysituations easily.Please note that call recording does not work oncertain handsets and can result in inferior quality of callrecordings and testing is recommended before using it for yourintended purposes.There are 3 default settings for automaticrecording in Automatic Call Recorder.•Record everything (default) –It records all calls except for contacts pre-selected to beignored.•Ignore everything – It records no calls except forcontacts pre-selected to be recorded.•Ignore contacts – It recordsall calls with people who are not contacts, except for contactspre-selected to be recorded.Automatic Call Recorder has thefollowing features:•Enable or disable automatic recording for allcallers or for a particular contact•Add notes and share recordingcalls through Gmail, Facebook, Skype and Bluetooth etc.•Integrationwith Google Drive™ and Dropbox allows calls to be saved andsynchronized to the cloud as well•Record calls in inbox fortemporary time so user can review it and transfer to recordingfolder for permanent storage otherwise inbox call recordings willbe automatic deleted after user specified time period•Increase ordecrease inbox size to better manage your memory•Enable callsummary menu with option to appear immediately after a call•Abilityto choose different audio file formats like AMR,MP3 and WAV•Abilityto change the default file folder to store call recordings•Enableor disable call recording notifications which will be appeared innotification bar•Set password to prevent authorized access to therecorded phone calls•Recover password through email•Automaticdeletion of recorder calls after entering 10 times wrongpassword•Enable automatic call recording by shaking the mobilephone•Increase or decrease shaking sensitivity of mobile phoneThisapp contains ads.Should you have any question regarding AutomaticCall Recorder, please mail us, thanks! Now you resume is always with you. If anyone asks you for yourresume don’t ask time to send your resume, either open the app,create the resume and share it or if already have the resumeprepared and ready then just share it. Resume Builder gives you theability to create your resume by just adding the information in theapplication and get a professional formatted resume which you cansend to apply in different organizations for jobs. Application iseasy to use and understand for the users and the user can easilyenter the information without any difficulty. The resume createdcan be viewed and shared by the user, but if the user doesn't wantto share the resume it get stored in the device and in the app as aprofile which can be later edited, viewed or share.ProfessionalResume Builder has the following features• Sample data can bepopulated in the app to create a sample resume.• Multiple profilescan be added and against each profile multiple resumes can becreated.• Checks and validations are added so no wrong informationcan be added by the user.• The resume can be generated and viewedin the PDF format (PDF viewer application should be available inthe device to avoid any inconvenience)• Share the generated Resumevia Email• Simple to use and elegant user interface.All thesefeatures are available in the free version of Professional ResumeBuilder and no need to buy the app. The app contains ads. Pleaseshare Professional Resume Builder with your friends and otherpeople you know. If you face any problem then let us know so thatit can be resolved. All the comments for improvements and positivecriticism will be appreciated. Hey Pro!The underground mafia leader wants you to be his driver. Themoney and power are waiting for you but to get that you need toprove yourself by stealing best cars as much cars as you can andshow them that you are the only great and clever car theft in thiscity.Grand Car Robbery is an excellent and adventurous drivingchallenge especially for expert drivers with beautiful graphics andmaps. It is a fun and addictive car robbery game.The owner has allowed you r to have possession of or easy accessto the keys. Break into a car and find that the owner has left aspare set of keys in the glovebox, and use these to drive the caraway.Steal various makes and models of vehicles, which are vary byseveral factors, including region and ease of theft. The securitysystems in these vehicles are not up to the same standard ascurrent vehicles, and learn their weaknesses. Scrap metal and sparepart prices are high and older vehicles are highly rewarded.Features:- Drive with traffic- Simple and intuitive control- Amazing 2D graphics- Explore a detailed open world environment- Cool cars- Cool soundtrack- Accurate physics- Easy to playMotor vehicle theft is the criminal act of stealing orattempting to steal a car (or any other motor vehicle). This gameis only designed for fun purpose and doesn't support any action ofrobbery by any means. Are you worried about private messages? How about to lock down yourprivate to get peace of mind? If your friends borrow your mobilephone for playing games, they will not be able to see your privateconversation. Want to protect your messages from others then SMSLocker is best available solution to protect your conservationprivacy.Private Conversation Locker has the following features• SMSlocker is password protected • Reset password through email usingthe Forget Password option• It is easy to learn and use• Importcontacts from your contact lists to private contact list• Sendprivate message from the app to anyone• It has an interactiveinterface• Private message notification on reception of messagefrom the private contact All these features of Private Conversationare available in the free version and you don’t need to payanything for such wonderful application.Like Private ConversationLocker and please share with your friends and other people youknow. If you face any problem then let us know so that it can beresolved. All the comments for improvements and positive criticismwill be appreciated. Are you receiving messages and calls from unknown numbers ? Use theCall and SMS Blocker to block all the messages and calls from theunknown numbers or block the contacts from the contact list. Make acontact list in the application.Application is easy to use andlearn, with an effective and user friendly interface. The blockedcall and SMS are stored in the app and notified to the user, fromthe notifications displayed on the status bar, so inform the userif messages or calls are received on the device. User can viewthose SMS and calls afterwards.A list of contacts can be made ornumbers can be added in the black list. Contacts can be added inthe black list either from the contacts or from the call logs ormanually by the users. The app gives an option to block the call,or messages or both, for any contact, and according to the optionselected the specific content is blocked by the application. Fromthe app the message can be sent or call can be made to the userwhose call or messages is received and stores in the Blocked Callsor Blocked Messages.All these features are available in the freeversion and no need to buy the app. The app contains ads.Like theapp., please share with your friends and other people you know.Face any problem, let us know so that it should be resolved. Allthe comments for improvements and positive criticism will beappreciated. You may be asking yourself what if I lost mycell phone or it is stolen? What will happen with your precious,valuable data on your phone when you lose it? Can you track it? No,then we have solution to your problem. Secure your device using themobile tracker application, with some distinctive features. Thisapplication is specially designed to track your device when it islost or stolen.The best feature of the app is that it cannot be uninstalledfrom the device like the other android traditional apps so the appcannot be deleted by the user/thief easily. The app can only bedeleted from the app itself but app is password protected.User can maintain 02 recovery numbers to track the device.Mobile Tracker Application sends location of the device if networkinternet connection or Wi-Fi is available otherwise recoverynumbers are informed through text message if unregistered SIM isinserted. The message sent to recovery numbers cannot be detectedby the user using the device with its unregistered SIM.The user can track the location of the device by ending textmessage with keyword “Track” from the recovery numbers device willautomatically reply with the longitude and latitude values and aGoogle map link of the device location. Additionally user canobtain call logs from the recovery number by sending text messagewith keyword “Call log”, device will automatically reply back tothe message with location details.Another interesting feature is to activate siren/alarm by sendtext message with keyword “Ring” which cannot be shut down even bychanging device mode to silent or vibration.All these features are available in the free version and no needto buy the app. The app contains ads.If you like it then share it with your friends. If you face anyproblem related to this application then please let us know to helpyou out. All the comments for improvements and positive criticismwill be appreciated. Loved shooting the targets from distance in the fun fair to getreward? Miss that shooting? Then the wait is over, we have broughtthe same exciting fun shooting game for you. AIM and SHOOT theswimming ducks in the addicting Duck Hunting Championship 2D game,to become the Ducking Shooting champion by scoring highest amongother duck shooters. The Duck Hunting Championship provides the Funand Addicting Shooting Experience to the players of the game. Shootthe moving Ducks appearing in the pond before they swim away ordive in the water. Simply tap on the Ducks to shoot them to earnthe scores, make the highest scores and set the record for others.Shoot continuously without any delay to score the maximum pointsand don’t forget to reload the gun. In this Championship, thegame-play level is increased as the scores increase by shooting theducks. On each level increase, player is rewarded with the extrabonus time for shooting and with extra bullet capacity reward toshoot down the ducks more efficiently.Dominate the Duck ShootingChampionship game leaderboard, and show your shooting skills to allthe players all over the world by scoring the highest points in theexciting, enjoyable and addictive game, with beautiful gamegraphics and sounds. AIM and SHOOT the ducks before the time ranout and ultimately lose the championship. Ready your shooting gear,set the aim and start shooting the ducks to become the ultimateDuck Hunting Champion.Help us spread to the word. Provide us withyour valuable feedback about our game. It is very hard nowadays to remember everything, especially thedates of different important occasions like birthdays, anniversary,etc., in the busy life. Most probably everyone forgets to send thetext messages to the loved ones on these precious occasions, nowthis can be handled using the SMS Scheduler app very efficientlyand effectively.Some of the features of the SMS Scheduler app areas follows:• Option to set the message text to be sent.• Option toset the exact date and time to send the message.• Option to set thefrequency of the message.• Export and import the messages•Notification after the message is sent.• Multiple recipients can beincluded in the SMS.• Maintain history of the sent messages fromthe app.All these features are available in the free version and noneed to buy the app. The app contains ads. Like the app and pleaseshare with your friends and other people you know. If you face anyproblem then let us know so that it can be resolved. All thecomments for improvements and positive criticism will beappreciated.